Well, the good news is in the very latest Tipster Profit Report, I welcomed a tipster meeting all 4 of these criteria into the Smart Betting Club Hall of Fame. This tipster has made 12.5% from 2069 bets since January 2014, ALL at Betfair SP minus 5% commission and costs just £7.49 a month to follow. Sounds too good to be true? Indeed it does, but I can assure you, it is very much true! The first thing I look for in any tipster is the ability to make a profit not just over a few weeks or months but long-term. Usually this means at least 12 months of proofing, preferably more and a significant set of data to analyse. In this instance, this tipster ticks all the boxes with a record of 2069 tips dating back to January 2014 and 518 points profit at a 12.5% Return on Investment. Not only is this an excellent standard of profit, but is based on more than enough data to draw firm conclusions that this tipster knows what they’re doing. After all, it would be night on impossible to fluke a profit over more than 2000 bets and nearly 3 years of tipping. In today’s world of betting restrictions, those of you making too much profit, and attracting the wrong kind of bookmaker interest are looking for tipsters to follow at Betfair SP. Certainly, it’s not easy for a tipster to achieve a profit at Betfair SP, but this is exactly what this service has achieved with all 518 points profit compiled to date. What’s more, this total of 518 points is AFTER 5% commission has been individually deducted off every winner to cater for Betfair’s usual charge. As the more you use Betfair, the greater your commission rate reduces, there is every chance you could improve on this return. Just as with many things in life, it doesn’t always follow that the more you pay for a tipster, the greater the profits you will make. There are many high-class tipsters offering memberships for affordable fees, and this service is no different with a simple pricing structure of just £14.95 per month. Your first month with them also costs just £3.79 to help you test them out. The even better news is that with access to the Smart Betting Club, you can enjoy a special ongoing 50% monthly discount on the cost of joining this tipster. Your first month will cost just £3.79 and then each month thereafter just £7.49. Over the course of 12 months, you would save as much as £89.52! This final point is often overlooked but it’s a vitally important factor. After all, if a tipster constantly forgets to send emails, misses out crucial information or just generally gives off an air of being run amateurishly, chances are you won’t follow them for long. There is no doubt this tipster runs his service professionally, with a single tip email arriving like clockwork every day between 9 and 10am. Everything is very clearly laid out and it takes no more than a few minutes to follow each day. Stakes are always a flat 2 point to win and as all bets are settled at Betfair SP, there is no odds or bookmaker advice – meaning no chasing a price. You can discover everything you need to know about this tipster, including an in-depth review of the service and how to save 50% on the cost of joining, with a Smart Betting Club membership. 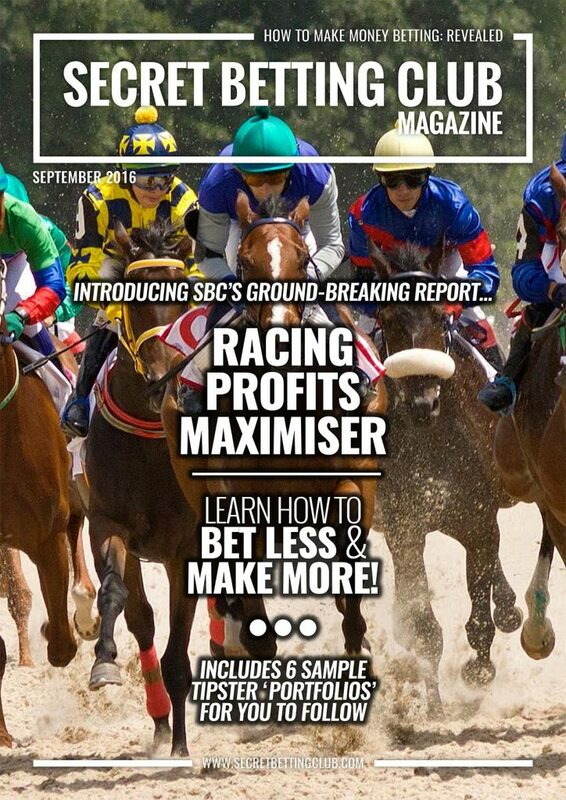 The tipster was first reviewed back in SBC 96 from March 2016 and after impressing us in the intervening 7-month period, was upgraded into our Hall of Fame in the latest Tipster Profit Report. 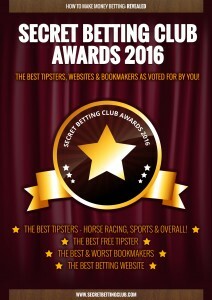 The Hall of Fame is our list of highly recommended tipsters and is currently 23 tipsters strong. Within it, you will find many more tipsters of the calibre of the one I have highlighted today – those that can help you make money from your betting. How Much Can You Make Betting? 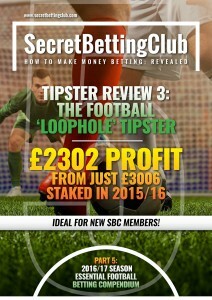 was the question we posed earlier this week, following the release of SBC’s latest Tipster Profit Report. Judging by my inbox, it seems to have piqued plenty of interest with several enquires asking just how much can be made with the tipsters SBC recommends. Therefore, to help explain, I thought I would share some of the profit tables published in this report with the 15 tipsters that made a combined £29,016 over the last 12 months. To firstly set the scene – inside October’s report, you can find the latest results from 58 different tipsters proofed up to the end of September 2016. Of those 58 tipsters, 23 of them hold what are termed ‘Hall of Fame’ ratings, which are those firmly recommended as worth following with your hard-earned! It is these ‘Hall of Famers’ that form the nucleus of the tipsters that Smart Betting Club members follow and what lie behind the profits many of them are making. In each Tipster Profit Report, you can find ‘Suggested Profits’ tables, that help to outline the realistic profits that Hall of Fame tipsters are making. 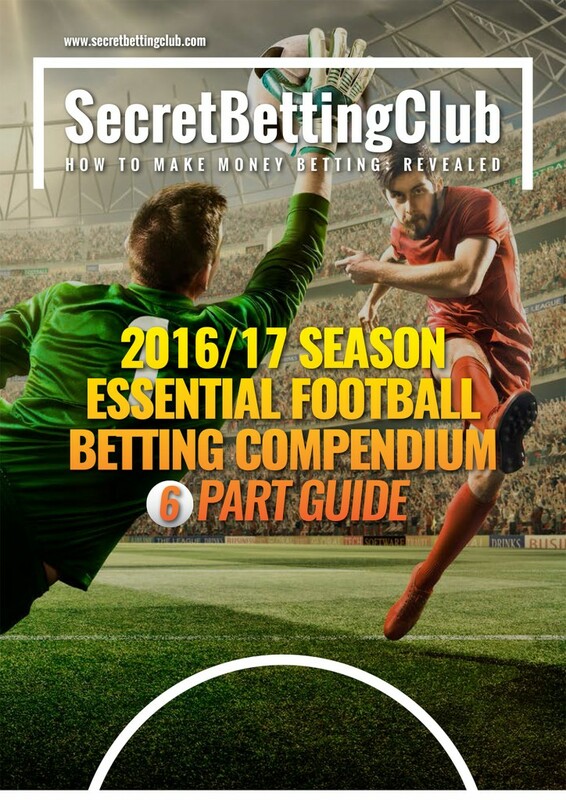 These are based on ‘Suggested Betting Bank’ recommendations that indicate the profits you can make if following SBC’s betting bank advice. If you are not familiar with betting banks – check out this guide I wrote on them back in May. 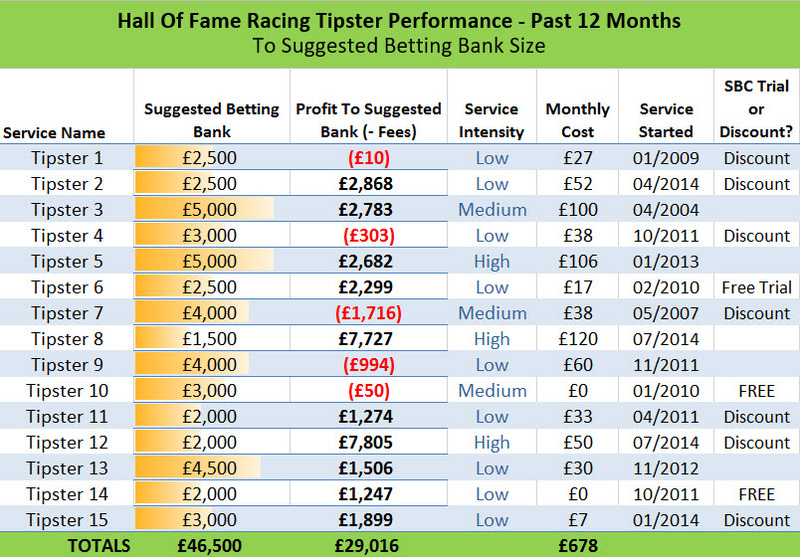 Using these suggested betting banks, below you can read the EXACT profit figures from the 15 Hall of Fame-rated horse racing tipsters over the past 12 months. It’s the third column you are looking for here (Profit to Suggested Bank – Fees) which highlight the profits each tipster has made (or lost) in the past year. I have removed the tipsters named and identified them as 1 through 15 for the purposes of this email. The headline figure to watch out for here is the combined profit of £29,016 from all 15 of these tipsters as generated over the past 12 months. The cost to make this sum? Just a £678 monthly outlay – a figure already deducted off the £29,016 profit tally. 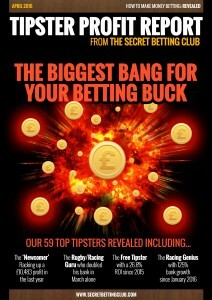 Although we don’t expect anyone to follow all 15 tipsters, if you did, you would certainly have made a serious profit! Service Intensity details how much time a service will take out of your day to follow. A high intensity rating suggests a tipster that advises several tips every day vs. a low intensity tipster that might put up just 1 tip per day. The Monthly Cost is the average subscription fee payable to the tipster for their advice and the start date is when they started out tipping. Finally, the SBC Trial or Discount column lists those tipsters either offering SBC members a preferential deal, be it a free-trial or exclusive saving of some-kind. There is quite a lot of information in this table – so allow me to help unpack it all and answer 3 of the most common questions it throws up. Question 1: Do you need to have the suggested betting bank sizes to follow these tipsters? This quite rightly, is a common question many people ask as the suggested bank sizes range from £1500 up to £5000. The answer is no – you can often follow these tipsters with smaller (or greater!) amounts if you prefer. They are merely a suggestion to help guide you. For those tipsters that either charge more in subscription fees or for whom you require a large points betting bank, then you will most likely need a greater amount to invest to make it worth your while. For those tipsters that are more affordable, for whom you require a smaller points betting bank OR who generate a lot of bets and therefore good Return on Capital, you can get away with a smaller suggested betting bank. It is not a 100% exact science but these suggestions should hopefully provide a good outline at the very least. It is also worth bearing in mind that if you’re starting off with only a small set amount of money, then some of the free or low-cost tipsters would be ideal for you. Question 2: Why don’t all 15 tipsters make a profit? It’s a fair question and the honest answer is that not every tipster is guaranteed to make a profit over every single rolling 12 month period. All of them have made substantial profit figures long-term but the vagaries of luck and occasional bad-runs do mean there are always a few at any given-time that run at a 12 month deficit. Would you believe me if I said all 15 were always in profit over every single 12 month period? Probably not and you would be wise to be sceptical as this is just not how betting works. Yes, the vast majority of tipsters we recommend make a profit, but there will always be a few enduring a bad run at any given moment. To put this all in context, only 2 out of the 15 above (Tipsters 7 and 9) have posted a loss of over £350 this past year, yet both have excellent records long-term dating back to 2007 and 2011 respectively. Both tipsters take a value betting approach with Tipster 7 particularly vulnerable to fluctuations in form, given as they back double-figure priced horses to win. It doesn’t take too many winners at 20/1 to change these figures – something we have seen repeated on a regular basis. Question 3: Which tipster should I choose? Perhaps the most common question of all, although it is always difficult to isolate the right tipsters for every individual as so much relies on your personal circumstances. His problem is that every Monday, Wednesday and Friday he goes to the gym, after which he sits down and enjoys a hearty protein-filled lunch. Therefore, 3 days a week he is away from his computer from around midday to 2.30pm. By the time he returns home on each of these 3 days, there is a good chance some of Tipster 7’s tips will have run OR that the odds on offer will have changed. Ultimately Tipster 7 doesn’t fit into his lifestyle. Instead, he follows the likes of Tipster 12 and 15 who supply tips earlier in the day, when he is able to get on with ease. All of which is why as an SBC member, you gain access to all the detail and information you need to help choose the right tipster for you. 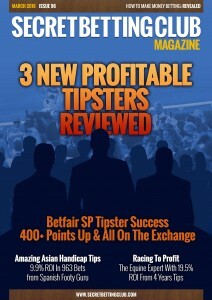 As a member, you can read incisive reviews of each tipster including advice on practicality of following (i.e. when and how they supply tips), odds availability and much more besides! Hopefully today’s article has helped explain a little bit more about how the Smart Betting Club can help you make money from your betting. 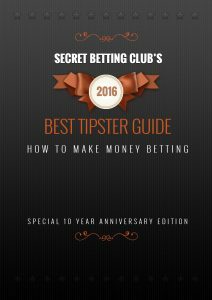 As an SBC member, you are provided with everything you need to know about the best tipsters for you – those that continue to make money betting. If you are keen to get started betting using some of the expert tipsters highlighted above, it’s currently a great time to sign-up with October’s Tipster Profit Report fresh off the press. 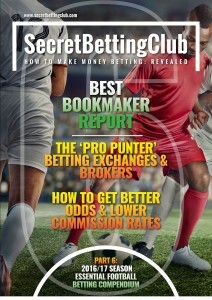 You can access this and a whole lot more besides the instant you sign-up for a Smart Betting Club membership. Best of all, you can do this and take advantage of our risk-free 90-day money back guarantee. Sign-up for your Smart Betting Club membership now! Unfair Bookmakers – Tell The CMA How They’ve Impacted You. Betting made the headlines today with the very welcome news that the Competition & Markets Authority (CMA) are opening an investigation into unfair bookmaker practice. Here is how the BBC covered the story. This represents a huge step forward for our Better Betting Campaign and major credit must go to Brian Chappell from the Justice4Punters group, who has been quoted extensively in the media today. As well as being a major contributor to our campaign, Brian has worked tirelessly to raise awareness of unfair bookmaker practice. The CMA has the power to make sweeping changes from ensuring bookmakers adhere to fair terms and conditions, through to compelling them to take bets from all punters. This latter point is perhaps more unlikely, yet if enough people raise it with the CMA, it could possibly be something they might like to scrutinise further. All told, today’s news is a very positive move forward for punters everywhere and we welcome the investigation. You can find out more about some of the issues raised by unfair bookmaker practice via SBC’s Better Betting Campaign. 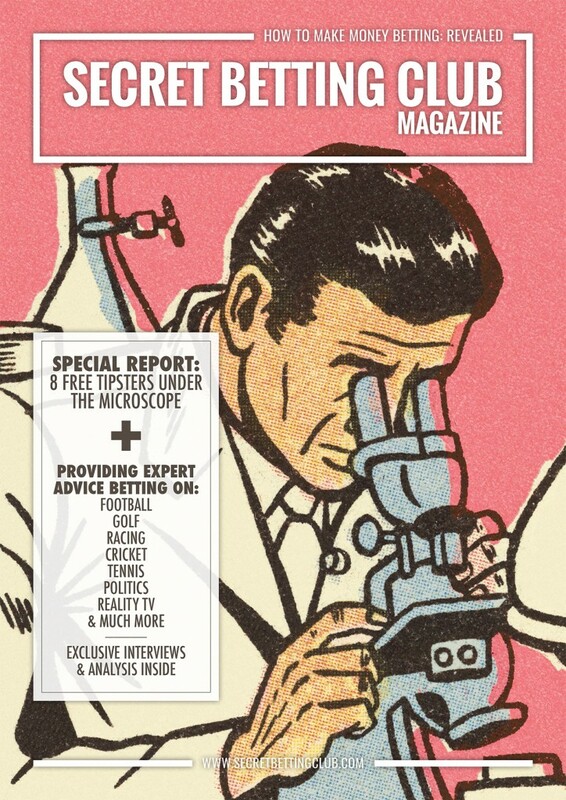 This includes a free downloadable report, entitled ‘Getting On’, which includes the results of a recent survey on bookmaker restrictions, advice from Brian Chappell on removing bookmaker tracking software and an interview with Simon Rowlands of the punter-focused, Horseracing Bettors Forum. 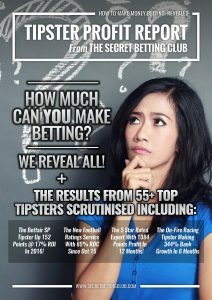 That is the question we answer in the our latest Tipster Profit Report publication, which features updated rankings and ratings on 58 top tipsters that we proof and verify the results of each and every day. Included within this report are our 23 Hall of Fame recommendations – those tipsters we fully recommend based on the long-term, practical and achievable profits they have made from their betting advice. 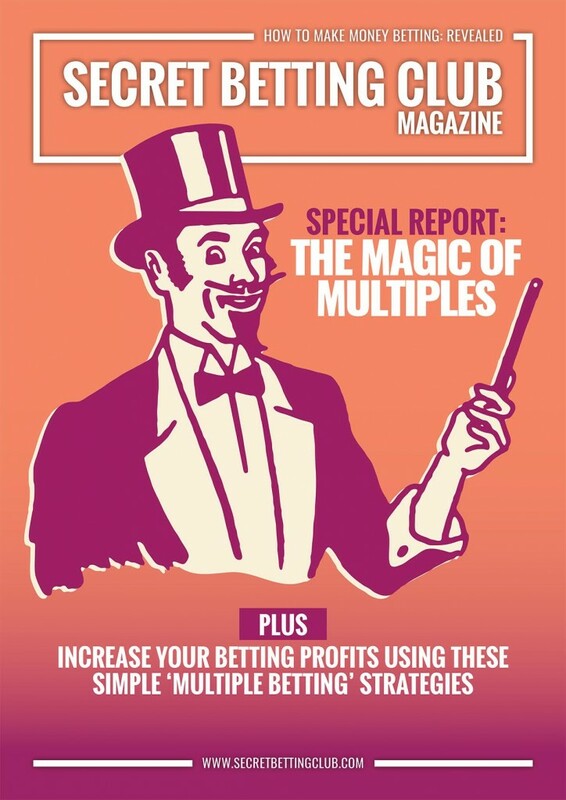 So if you ever wondered just how much you can make betting – make sure you pick up this special report! INSIDE OCTOBER’S TIPSTER PROFIT REPORT…. 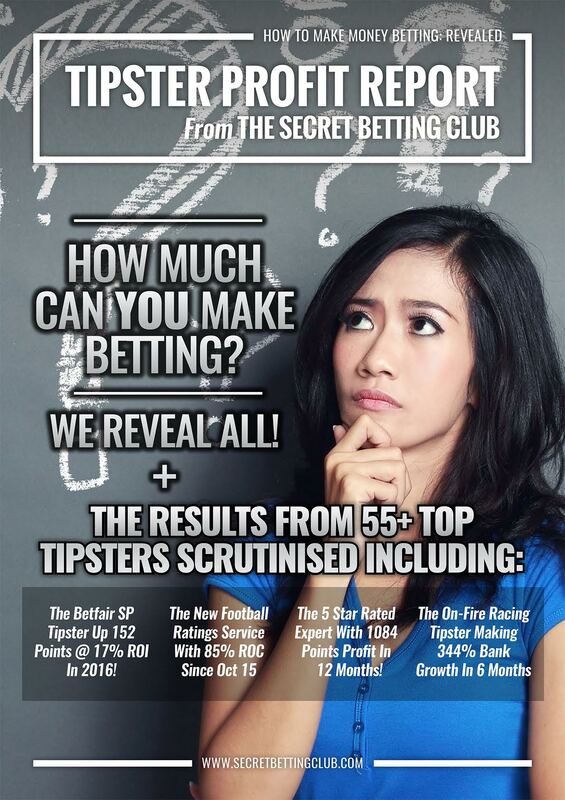 58 Top Tipsters Scrutinised Including…. • The Betfair SP Tipster up 152 points profit at 17% ROI already in 2016! To help with this we breakdown the 58 tipsters into different categories so you can easily compare and contrast them. > Detailed Ratings On Every Tipster: Each of the 58 tipsters we track has its own designated Key Facts Page with 10 different ratings on everything from cost to customer service and profitability. And all from the only 100% independent tipster source! Yes, that’s right as whilst all other review sites use affiliate links or make money referring sales to tipsters, all SBC tipster reviews and ratings are 100% independent and affiliate-free. Not only this but as an SBC member you can also download our monthly Betting Magazines, Practical Punter Reports & enjoy the peace of mind of our 90-day Money Back Guarantee if not satisfied once joining! On Sunday the findings from our recent survey on bookmaker account restrictions and closures were the topic of debate on BBC Radio 5 Live. Featured, as part of the ‘5 Live Investigates’ show, it sought to seek answers as to why bookmakers are refusing to do business with customers who don’t fall into the category of ‘mug-punter’. You can listen to it via this link from the 47 minute marker. Our survey found that, of 6575 bookmaker accounts, 4654 (70.78%) of them were either restricted or closed. The full results of which you can read in our freely available ‘Getting On’ Report, which you can access via our Better Betting Campaign. The BBC was able to do something that no-one else has done before- they got the Bookmakers to talk! So, you may wonder, why are they restricting and closing thousands of accounts? Boylesports Limits Due To Fraud! Boylesports, lest we forget, were found to be the absolute worst bookmaker for this practice, with only 10.8% of those we surveyed able to bet without restriction or closure. Why then, do they continue to claim that the main reason they impact accounts are when they suspect fraudulent activity? Are they really claiming that the 89.2% of punters affected by restrictions and closures in our survey are ‘’often’’ committing fraud? I suppose it’s also a major coincidence that the majority of these punters are also fairly shrewd and might, just might, make money from their betting. On the face of it – the fraud line is a convenient excuse as they can simply hide behind the ‘we can’t discuss individual accounts’ line – yet, in reality, it would be a huge stretch of imagination to envisage that each of the 89.2% of punters unable to bet with Boylesports is due to fraudulent activity. According to Skybet and Paddy Power, however, this seems to be a major problem for them. So, is insider information really the main reason why 67.4% of all Skybet customers (who took our survey) have been restricted or closed? And the same for the 73% of Paddy Power customers we surveyed? Paddy Power and Skybet need to do better than to try and hide behind such a flimsy excuse. Why Aren’t Bookies Willing To Speak Honestly? It was no surprise to hear some of the lines trotted out. When it comes to restrictions and closures the bookmakers seem to have ZERO interest in discussing it openly and honestly. They want to do all they can to undermine surveys like ours and those that the Horseracing Bettors Forum ran earlier this year (which identified very similar issues). We saw that with some of the other bookmaker statements released to the BBC. After all – If the truth is exposed that those who are good at betting run a very real risk of being closed down then would people bet as much in the first place? Perhaps not! As Simon Rowlands stated in the BBC 5 Live show – betting is aspirational and people do it in the hope of being successful and winning money. Here at SBC we have long been aware that engaging with bookmakers on this issue is a dead-end and, instead, are proposing a different approach to moving this topic forward. Firstly, inside the Getting On Report, you can find advice on how you can demand action from your MP and an investigation into bookmaker restrictions and closures from the UK government. You can also discover how you can complain to the Information Commissioners Office about the usage of hidden bookmaker tracking software and demand they investigate further. We are also encouraging as many people as possible to contact the Gambling Commission on this issue as they are currently inviting people to do so on the betting topics that matter to them. It’s part of a new two-way conversation they are holding with consumers. Page 6 of their listening plan (download PDF) encourages you to write to or email them via consumers@gamblingcommission.gov.uk. We have to stand together on this, as always, there’s power in numbers. The more that people raise these issues, with the 3 aforementioned organisations and others, the more chance we have of action being taken in the future on this front. You can read more about the issue of betting restrictions and closures via our Better Betting Campaign. This campaign also highlights other issues that we want to see tackled including that of the increase in disputed payouts and delayed withdrawals. We were very encouraged by the statements made by the Gambling Commission, on the BBC radio show, regarding this issue which suggests change is coming. The Gambling Commission’s chief executive, Sarah Harrison, stated that she felt that there were strong question marks as to whether the current terms and conditions overseen by bookmakers were fair and clear. In her opinion, bookmaker terms are overly long and complex and she feels that the pendulum has swung too far in favour of the operator. Let’s hope we see some firm action on this front from the Gambling Commission before too long! You can find out more about our survey on restrictions and closures and a lot more besides via our Better Betting Campaign page, a central resource to drive awareness on various key issues. Our aim is to help punters, like yourself, to take action and to provide you with practical, expert advice which will allow you to get your bets on. Through our new Better Betting Campaign we have been highlighting some of the unfair practices bookmakers currently employ – including that of restricting and closing your betting accounts. How exactly can you get your bets on in today’s modern betting world? What advice can the Smart Betting Club provide to help you do this? Well, the good news is that there are solutions at hand and ways and means to go ‘undercover’ with the bookies and either fool them into thinking you are a ‘mug punter’ or bet in such a way that they welcome your business. As part of our quest to share some of this insight with you, in Part 4 of our recently released ‘Getting On’ Report, we featured an article written by a ‘bookie insider’ on just this topic. He has spent years working on both sides of the betting fence so is uniquely positioned to offer advice about how to get your bets on. His approach is all about ensuring your account is coded as ‘safe’ in its infancy and following certain strategies to fool the bookies into thinking you don’t know what you are doing. Even though you do! An Insider Speaks – How To Avoid Unwanted Bookie Interest! “From the point of view of someone who has been on both sides of the fence over the last 15 years or so, it’s best to view the battle between shrewd punters who want to maintain winning accounts and the bookies who want to shut them down as a game of cat-and-mouse. Tracking software has become ubiquitous with all major bookies – the likes of iesnare and iovation have been the subject of huge controversy as the grey area of customers’ privacy is challenged. But avoiding these legally-dubious methods is just the first step to take when engaging in the battle of smarts and wills with the online bookmaker. So before a punter even considers opening an account on any platform, an essential pre-requisite is to use a fresh device for each new set of accounts. There’s no point going to the effort of persuading a friend to furnish you with their bank details only for a firm’s spyware to link you to a restricted account before you even place a bet. Game over. Once anonymity is ensured, though, there are ways by which ‘unwelcome’ punters can keep under the radar of the bookies’ account-coding teams. To get an idea of how to go about this, try putting yourself in the bookie’s shoes – if you were charged with coding accounts as good or bad for business, what would you do?The customers that firms like the best are those who lose consistently and reliably, whether involving big or small amounts. Punters like this who lose small (probably 95 per cent of a firm’s active clients) rarely appear on the coders’ radar as the system filters their bets out as irrelevant – they’ll generally be small non-price-sensitive stakes on big markets, or multiples thereof. To come to a coder’s attention if you have a young account generally would require an account to feature bets on small markets or niche events with bets close to the maximum stake allowed. If you open an account and your first bet is a large one at a stand-out price on, say, a speedway event, it’ll raise a red flag. Consider opening your account and making your first wagers at a busy time for the firm – the afternoon of the opening day at Aintree or Cheltenham will guarantee your first few bets will sneak through unnoticed. Together with a sign-up offer, a few doubles or trebles on horses close to best price will fit in with the profile of a typical punter, all while giving an expected return of close to 100 per cent of your outlay. Unfortunately this strategy will almost inevitably entail losing money for the first few bets but smart punters have to consider the long game – with the bigger picture in mind this should be considered a sacrifice worth taking. Only once your account reflects the behaviour of a casual punter should you try to draw attention to it by striking bets that will get you noticed by those monitoring the bet streams. ‘Mug’ bets on any sport but particularly football accumulators or side markets at below top price should be considered. 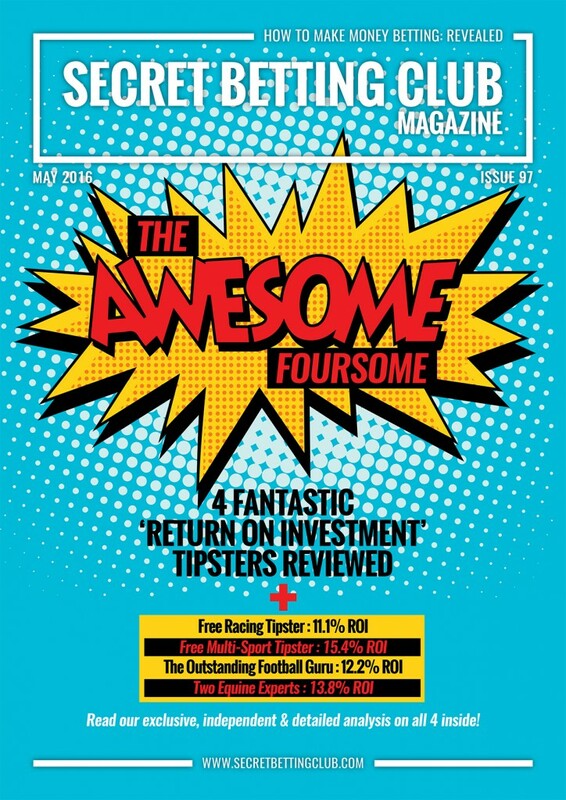 If you enjoyed this article, you can also read a further 5 interviews with professional punters on just how they get their bets on via our Free ‘Getting On’ Report. The key thing to take away from all of this is that whilst bookmakers might not play fair – there are still plenty of things we can do as punters to legitimately keep our betting account safe and usable.